LionsDeal > Shop By Business > Church Supplies > Church Dining Supplies > Beverage Service >< Coffee and Tea Servers > Winco VSW-64W White Insulated Swirl Design Beverage Server 64 oz. Winco VSW-64W White Insulated Swirl Design Beverage Server 64 oz. 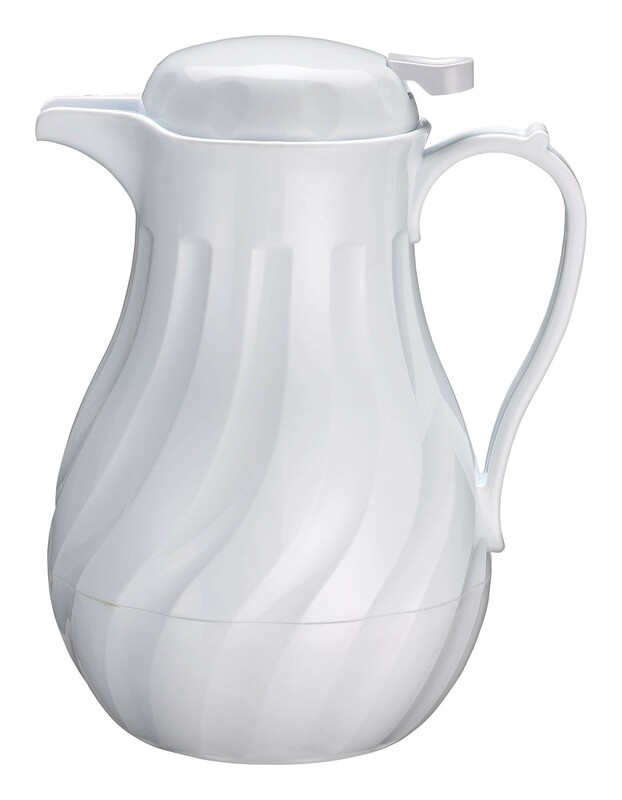 Use the Winco VSW-64W White Insulated Swirl Design Beverage Server 64 oz. to serve steaming hot tea and coffee. With its double wall insulation it maintains the desired temperature, and its durable plastic construction makes it strong enough to handle years of heavy commercial use. For added convenience, it has a push-button top that makes it simple to open and close, while its wide handle offers a comfortable, non-slip grip. Featuring a charming swirl design and a fresh white color, this beverage server is attractive enough for any upscale dining establishment. It also comes with labels for "regular", "decaf" and "tea", so you can mark your carafe to eliminate confusion and be sure your guests get the drinks they ordered. 7-2/5" x 6-9/10" x 11-1/2"
Carafe was exactly as described. Feels as sturdy as can be expected . The swirl thermal carafe does just what I wanted it to do. It keeps coffee hot for hours for my guests and it is stylist and easy to use. I am very pleased with this purchase. This carafe works beautifully. It keeps the water for tea hot for a long time and is beautiful. Q: What is inside... glass? steel? Is this double wall construction?